Cristina has many years of experience working in the third sector and is a passionate advocate for people with Down’s syndrome and other disabilities. 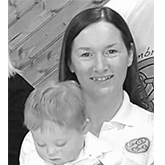 As Secretary for Cumbria DSSG she actively promotes positivity and raises awareness and works closely with other Charities and Voluntary groups. Christina has mentored parents at Sure Start Centres and was a Director on the Board of The Five Lamps Organisation from 2003-07. She has three teenage children and a 17 month old son, who happens to have Down’s syndrome.